Five central and eastern European countries joined Australia, Fiji and Brazil in opposing the measure. Afghanistan, Angola, Bahrain, Bangladesh, Burkina Faso, Chile, China, Cuba, Egypt, Eritrea, Iraq, Mexico, Nigeria, Pakistan, Peru, Qatar, Saudi Arabia, Senegal, Somalia, South Africa, Spain and Tunisia voted in favor. This indicates the Israeli systematic policy to target the medical personnel and obstruct their humanitarian work guaranteed with protection according to global humanitarian law. The vote had 23 states voting in favor, 8 against and with 15 abstentions, condemning Israel's "apparent intentional use of unlawful lethal and other excessive force" against civilian protesters in Gaza. In one more week, it will be the one-year anniversary of the Hamas terror-led violence that has taken place every Friday - and sometimes even daily - at Gaza's border with Israel. A Palestinian throws rock in response to Israeli forces' intervention during a protest within "Great March of Return" demonstrations near Al Bureij Refugee Camp in Gaza City, Gaza on March 22, 2019. Especially in killing 189 Palestinians and wounding over 6,100 at weekly protests in 2018. Since then, about 190 Palestinians and an Israeli soldier have been killed during the weekly rallies. While it acknowledged that the army has opened several internal army inquiries into the shootings of apparently uninvolved civilians, it doubted the government's willingness to honestly scrutinize its policies and actions. 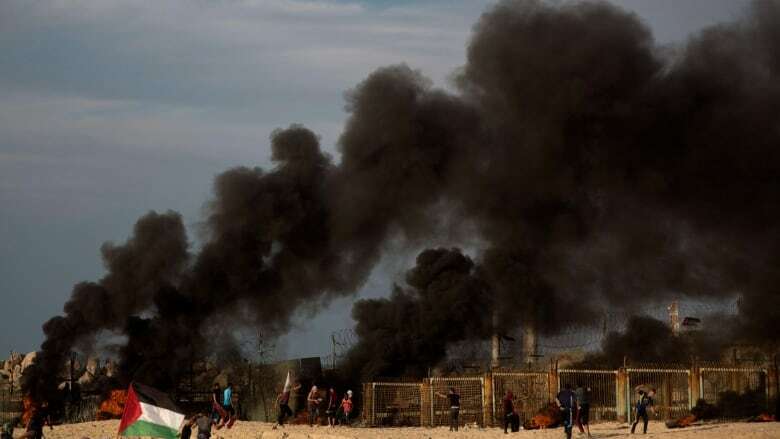 Illustrative: Masked Palestinians calling themselves the "night confusion units" hold incendiary devices attached to balloons to be flown toward Israel, near the border with Israel east of Rafah in the southern Gaza Strip, on September 26, 2018. Three Injuries of those wounded were reported serious.